• Lebanon likes at the eastern extremity of the Mediterranean, bordered by Syria to the north and east, and Israel to the South. • Religions: Lebanon is a crucible of the three great monotheist religions – Christianity, Islam and Judaism – and is home to 16 state-recognised faiths including Judaism. 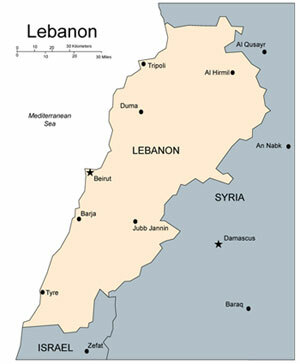 • Lebanon won independence from France in 1943. The country’s constitution distributed political representation according to this confessional dynamic and its demographic spread. The president is drawn from the ranks of the Maronite Christian community, the Speaker of parliament a Shia Muslim and the Prime Minister a Sunni Muslim. Other religious communities – including Greek Orthodox, Druze, Greek Catholic, Armenian Catholic, and Protestant – are represented. • The economy is driven by banking and service industries such as tourism and hospitality. A substantial of the country’s income comes from the millions of Lebanese ex-pats. • Around 38% of the country is under cultivation with wheat, vegetables, fruit, tobacco and olives the main crop categories, as well as considerable livestock farming. Industry ranges from cement to textiles, clothing, furniture, canned goods and light metals.